Hey Jeremy! I have a request because I know that you know alot about chocolate!! I need a recipe of a soft ganache filling that I can flavour with coffee to pipe inside a chocolate mould to make truffles with runny centers do u know what I mean??? The following makes quite a bit of ganache for piping into shells. You can divide the recipe in half, if you don’t need that many. This is a good starting point for a pipe-able milk chocolate ganache. As for the coffee flavouring, you can either whisk an instant coffee into the cream just before adding the chocolate, or use a shot of espresso if you have access to an espresso maker. You can also go the coffee flavoured liqueur route, and add about 50g before adding the chocolate. The strength of the coffee flavour is dependant on personal taste, so feel free to experiment. I’ve also made cappuccino truffles by using white couverture, and increasing the amount by 100g. To use the above recipe for a dark truffle, the cream and dark couverture should be 900g each. you can change the flavours all you want, but try not to toy too much with the composition. There is a delicate process involved in the recipe formulation that keeps the ganache from separating. Keep in mind that oil and water don’t mix. Bring your liquids to a boil, then carefully dump in the chocolate. Don’t whisk it at this point! use a rubber spatula to make sure the ganache is blended together, but try to avoid mixing air into it. From here on out, air is the enemy. Set the ganache aside to cool, and cover with plastic wrap. Make sure there is no air between the wrap and the ganache, you don’t want bubbles. The reason you don’t want air is that air pockets inside the truffle allow space for mold to grow. Being diligent in keeping air out will give your truffles a longer shelf life (they should be good for about 2 weeks). Once the ganache has cooled to room temperature, it is ready to be piped. Keep it covered if it’s not going to be used right away. 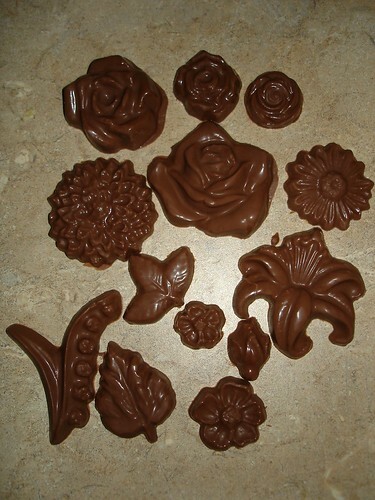 Once piped into shells, allow ganache to set, then cap them with tempered chocolate, roll them, and decorate as desired. What better day to delve into a little history about my favorite new world discovery, chocolate? The Mayan, Toltecs, and Aztecs were all familiar with the beans the Aztecs named cacahuatl. They traded them in markets with the dual role of food as well as currency. Conquered provinces were allowed to pay their taxes to the Aztec rulers using the beans as currency. The Spaniards, led by Hernando Cortes, discovered a huge reserve of cocoa beans in the possession of the Aztec emperor of Mexico, Montezuma. Somewhere along the line, the people discovered that a chemical reaction takes place which mellows out the flavour of the beans if they are allowed to ferment. This was the first development in turning the beans from currency into food. Systematic cultivation, fermentation, and further processing soon followed. In this pre-European era, it wasn’t yet possible to keep the oil and fatty part of the beans separate from the water to which it was added. The way they made xocolatl (xoco = bitter, atl = water) was to add cold water to the ground up beans, and stir it vigorously with a wooden whisk, so that the paste remained suspended in the water. It was reported that Montezuma drank xocolatl several times a day from beakers made of pure gold. The natives were also inclined to spice the drink with native vanilla, wild honey, pita juice, and occasionally chile powder. Spanish officers added aniseed, cinnamon, almonds, and hazelnuts. It wasn’t until it was brought back to Europe and modified a great deal over several centuries that chocolate took on the form we know today. Traditional Mexican chocolate is still made by roasting the beans, grinding them on a flat, porous stone with a stone rolling pin until the fats and solids form a pliable mass. It is then pressed into blocks, bars, or balls. I have a recipe for traditional Mexican chocolate, but a lot of patience, strength, and know how are also involved. Bring a coffee pot full of water to a boil, and add for each portion 2/3 of an ounce of grated or finely chopped chocolate with an equal quantity of sugar. Allow to boil for 7-8 minutes. Fortunatly industrialization has given us cocoa powder and Nestle Quick, among other chocolate products, so we don’t have to slave over a grinding stone to get our chocolate fix. As should be evident throughout my site, I am a big fan of a number of specific food and drink products. Among my favorites are coffee, wine, and artisanal baking. Having said that, there is only one singular ingredient that, at least for me, has created a type of fanatacism. That ingredient is Chocolate. Chocolate has several similarities to many of the other food products I’ve already listed. It begins as an agricultural product, requires fermentation, and roasting, and produces a product based off of a very minimal number of ingredients that have an infinite number of unique flavour and creative possibilities. The ultimate outcome is based on the quality of the ingredients and the skill of the craftsman. Much has been written on the subject of Cacao production (within the industry, cacao refers to the agricultural process and product of that process, the cacao pods. Cocoa refers to the products produced from the pod). Although I feel it is important to have an understanding of this process, the average home-based chocolatier will never be involved in this process. Just know that cocoa powder and cocoa butter are two by-products of the refining process, and chocolate is the combination of cocoa solids, cocoa butter, and sugar. I may write more about this in a later post. Chocolate production for most chocolatiers begins with selection of the chocolate they will use. Again, quality is key, so don’t skimp out. Chocolate (commonly labeled as couverture) contains certain percentages of cocoa solids, sugar, and fat content, usually provided by cocoa butter and/or milk (hence the term milk chocolate). There is a product called chocolate coating, which many small chocolate shops (at least in my area) try to pass off as real chocolate. Coatings can not legally be called Chocolate, and contain products not found in real chocolate, such as vegetable fats, bulking agents, and wax. Coating chocolate is used by some places because it is cheap, requires no tempering, and therefore little skill on the part of the chocolatier. If you are familiar with couverture, and how properly tempered chocolate should look and taste, you can spot coating chocolate right away. On selecting chocolate, there are several different brands available. You’ll find that some people swear by one company, while other people swear by another. Like wine, I think it should come down to personal taste as much as anything. If you like Valrhona, use it. If you prefer Callebaut, use that instead. Reading the labal on the side of a box of couverture, you will see something like this: 60/40/38. This means that there is 60% cocoa solids, 40% sugar, and 38% total fat content. This would be a dark chocolate. An average milk chocolate example would be 36/42/38. These numbers are important to understand, because the first tells you roughly how dark the chocolate will be, the second will tell you if it’ll be bitter or sweet, and the third will give you an idea about how viscous it will be to work with. The higher the fat content, the more viscous. 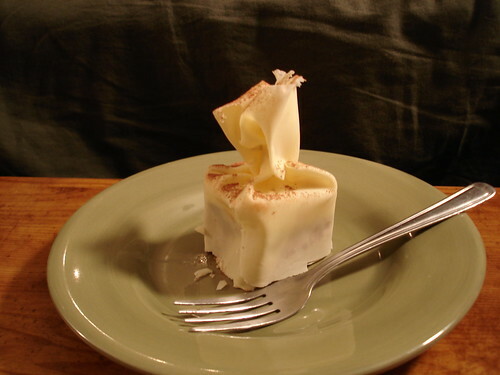 Keep in mind that it is possible to add cocoa butter to chocolate to thin it out more while working with it. Cocoa butter has a very low melting point. If you put a flake of it on your hand it will melt right away. White chocolate, which I haven’t yet mentioned, should be beige or off-yellow. If you come across white chocolate that is snow-white, it’s coating chocolate. The reason for this is because white chocolate contains no cocoa solids, and is therefore mainly cocoa butter and sugar. It takes on the colour of the cocoa butter. It’s good to keep all of this in mind while working with chocolate. Dark chocolate tends to be much more forgiving while tempering than white or milk due to the higher percentage of cocoa solids, and lower amount of fat and sugar. Because of this, dark chocolate tends to set harder than the other two. When making a multi-layered mousse, for example, you want to have the darkest mousse at the bottom for structural stability. Selection of chocolate for eating is, in my opinion, another personal choice. If you prefer milk chocolate, eat it. If you are a die-hard dark chocolate fan, that’s fine two. At one shop I worked at, we had a guy who always wanted the darkest chocolate we had, and even then it wasn’t dark enough. We ended up getting some 90% couverture from Michel Cluizel http://www.chocolatemichelcluizel-na.com/ , which to me tasted like cocoa powder. It was sooo bitter, no sweetness to it at all. The guy loved it. I have also been fortunate enough to catch one of Jean-Pierre Wybauw’s chocolate workshops http://www.jeanpierrewybauw.com/ . This turned out to be a great event for meeting other chocolate professionals in my area. I have remained in contact with a few of the people I met there, and even had the good fortune of working with one of them for nearly a year. As it turns out, she lives two doors down from the house I grew up in. I haven’t lived in that town since I was 17 (which, I’m sad to report, was quite some time ago.) It’s a small world, I guess. Chocolate bags, originally uploaded by adelphos24. 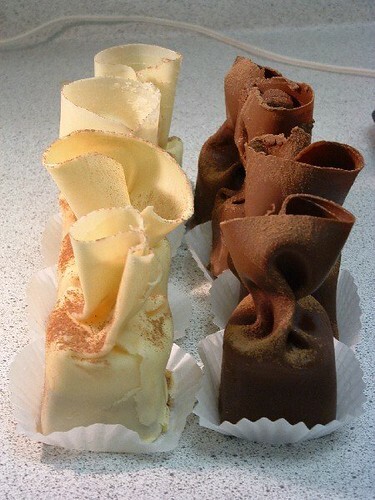 When I was doing my apprenticeship, the pastry pictured above was the one that gave me the most difficulty. The inside is a cake called a chocolate marquise. It’s a very rich, dark chocolate mousse with a flowing white chocolate ganache center. The outside is a paper thin shell of chocolate, formed by hand, with split second timing and precision. I had a lot of frustration trying to get this dessert to work for me. The pastry chef who taught me made it look so simple. He could whip up 50 of these in no time, while I struggled with four. I didn’t realize it at the time, but the most useful skill I learned while struggling with this was patience. I worked at it for quite a while, and then one day it just seemed to click. My skill improved drastically after that. This pastry was one of the most difficult things I had to learn how to do, but it’s now one of the things I’m most proud of. 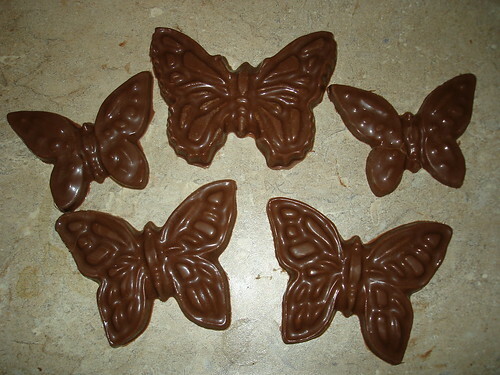 chocolate butterflies, originally uploaded by adelphos24. 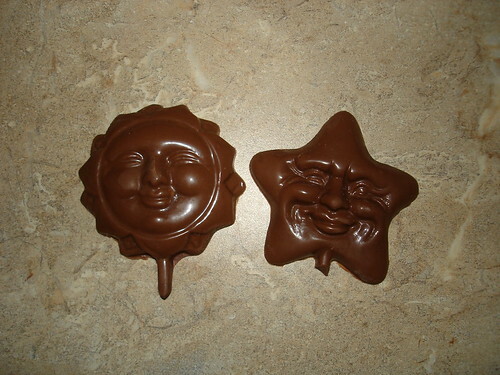 Just some pictures of a test run of my newest chocolate molds.